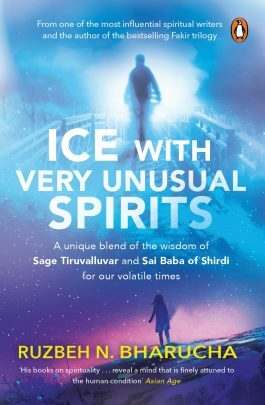 Ruzbeh N Bharucha's latest book, ICE with Very Unusual Spirits, is a book that I have absolutely enjoyed reading. While reading every chapter, I began to contemplate a lot on the friendships in my life, as the book blends in some of the most valuable teachings of Sage Tiruvalluvar and Sai Baba of Shirdi. The essence of the book revolves around true friendship and how it can make us not just more human but it can make us divine beings too. A friend whom we knew since childhood days invites us home for dinner but when we visit, we don't get served dinner, but popcorn. Our mistake? We arrived in an auto, instead of a taxi (it is a different story that our taxi had broken down half way and we took an auto that was available!). They probably worried that they had refugees in their home. 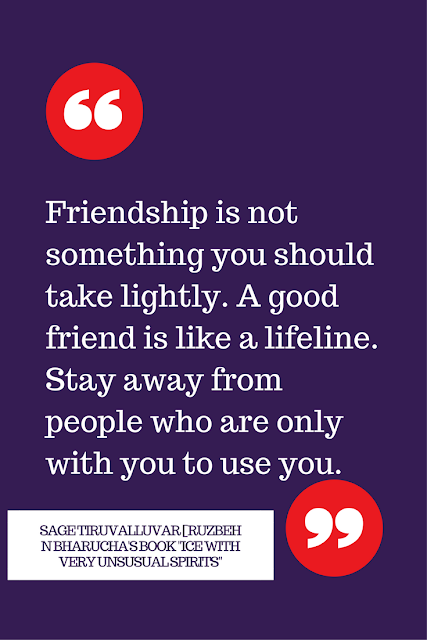 This is perhaps the biggest test of friendship - how money, social standing and ''prestige'' affect the quality of friendships, how true are we to our friends and the very pillar of friendship? I have shared this experience in full detail so do read this here! Look back at your life. You may have had amazing friends in school and gradually the quality of friendship may have changed once you reach other milestones in life. Do this for yourself. Examine the quality of your friendships with simple pointers. This is not a negative exercise to judge your friends - it is a test of self-awareness. 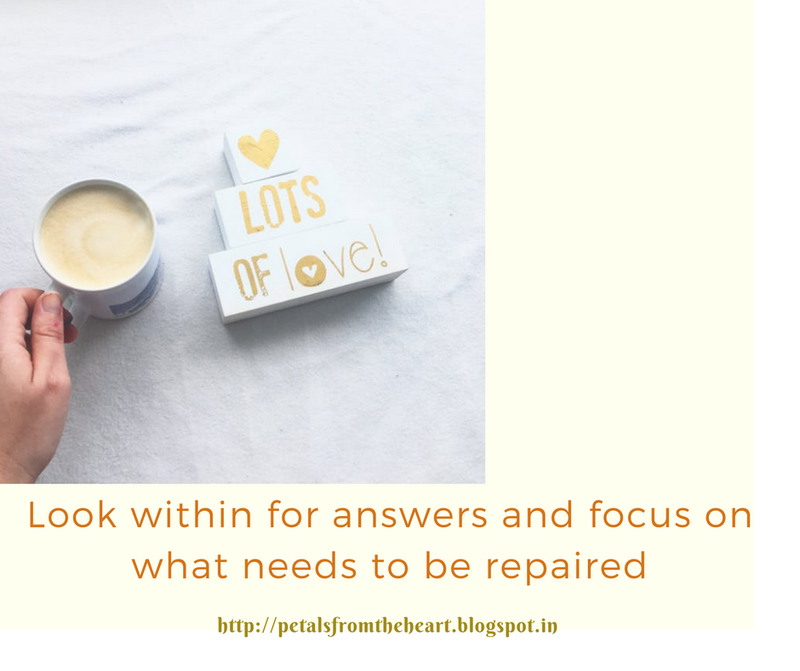 Look within for answers, do not judge, just understand the depth of each relationship, focus on what needs to be repaired. The Sage says very clearly that we should not judge or hate or hold resentment towards others. 1. Do your friends mock you, judge your choices (it could be your weight, the clothes you wear, your faith, your family, etc) and make you feel that you are not good enough? 2. Do they always stand by you, giving you their honest feedback with love, but ultimately, they support what you love to do? 3. Do they ditch you when you are no longer useful to them? 4. Do your friends message you only when they want things done for themselves? 5. Do your friends stop talking to you because you have different political and religious views which you express on social media? Remember, ask yourself too whether you are guilty of any of the above towards your friends. Find ways to strengthen the quality of friendship in your connections too. Keep in mind that our expectations are the reason why we tend to feel disappointed in relationships. Time to expect less from friends? Remember, our circle of friends are usually those who make us feel good and happy about ourselves. They may have different lifestyles and cultural backgrounds but they are the ones we look up to, confide in and share things with when we are happy, or when we are in distress or when we need to get advice or celebrate something that is personal, professional or simply emotional. Ultimately, the most important question is this - how do your friends make you feel? Do share your thoughts with me. You can connect with me on Twitter and on Indiblogger.